Oh dear, it's been a while. Four months in fact. I can only blame work, which has been so ridiculously busy that I have lived off a diet of takeaways, oven pizza and whichever quick and easy pasta dishes I had to hand. And then there was the heatwave, and I didn't feel like cooking at all, so ate nothing but salad and gazpacho. Anything to avoid turning on the oven. But, doing a big shop recently, I suddenly felt like cooking again. I've bought ingredients for all of my favourite summer recipes, more salad, more avocados and of course, more gazpacho. Arriving home at a sensible time for the first night in ages, I rolled up my proverbial sleeves and found myself in the mood to cook. Nothing fancy - it's still too warm for that - but a lovely, summery frittata which is as good cold as it is warm, and is a fantastically quick evening meal. I can't think of anything I'd rather eat at the moment. Preheat your grill and gently heat the frying pan over a medium heat. Add the onion and cook until just starting to turn golden, then add the spinach and toss for a minute or two until wilted, then remove from the heat and allow the vegetables to cool slightly. Beat the eggs in a bowl and season with a little salt and pepper. Crumble the feta over the spinach and red onion, and then gently pour in the egg. Stir a little to distribute the egg, spinach and feta evenly, then turn the heat back on and cook over a low heat for 3-4 minutes. Next, carefully place your frying pan under the grill for a further 2 to 3 minutes, or until the frittata is golden and cooked through (check the centre with a fork - it should be firm and without runny bits). 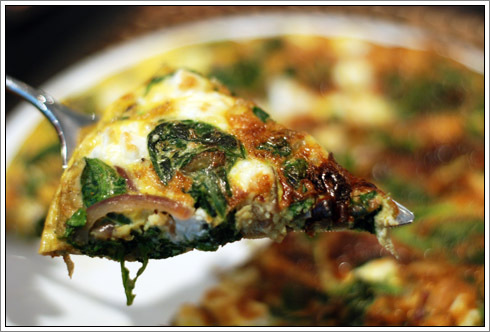 Put a plate over the pan and turn over quickly but carefully – the frittata should come right out. Serve hot or cold - I love it with a green salad with lots of avocado and a basil dressing. market researcher who lives in west london with her husband and collection of cameras. when not working, she likes food, taking photographs and sleeping. she also likes one too many glasses of wine.